The Bradley women’s basketball team battled back from slow offensive first halves twice this past weekend at Valparaiso and Loyola. 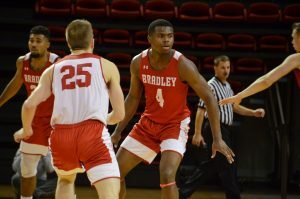 Bradley fell to Valpo 76-73 on Friday after a second-half run wasn’t enough to erase a 16-point deficit. On Sunday, Bradley capitalized on strong defense and a clicking offense to hand Loyola its first home loss of the conference season, 69-56. The Crusaders made their first six shots from the field to start the game. They converted on six of eight 3-point attempts in the opening quarter while holding the Braves scoreless for four minutes. Valpo led 27-13 after the first quarter of play. Spelhaug was subbed in five minutes into the game and finished five of eight from the field for 13 points and had five offensive rebounds, nine total, in a career-high 27 minutes. At halftime, Spelhaug led the Braves in scoring with 10 and Bradley trailed 38-29. Bradley came out with a plan to whittle away at the Crusader lead and eventually tied the score at 54 with 8:18 left to play in the fourth quarter. The Braves took a brief 30-second, two-point lead with 4:58 left after freshman Lasha Petree’s jump shot. Valpo responded with a three and won the game at the free-throw line. Gorski told Hammond on WIRL after the game she was disappointed in her team’s effort of following the pregame scouting report and their dismal 11-20 shooting from the charity stripe. On Sunday in Chicago versus Loyola, it was the Chelsea Brackman show for Bradley. She scored a career-high 24 points, pulled down 20 rebounds and blocked three shots in 37 minutes of play. Again, the Braves missed shots in the first quarter and the defense did not execute. After one quarter of play the score was tied at seven. Brackman scored five of the seven and had seven rebounds in the quarter. Bradley shot 1-16 for the first 11 minutes of the contest, but 20-48 for the rest of the game. Loyola shot 23-59 for the game but only scored six points from the free-throw line. Bradley scored 19 points at the free-throw line on 27 attempts. 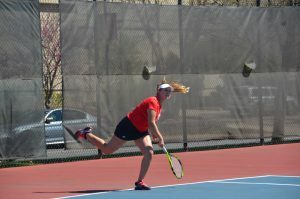 Gorski was proud of the bounce back effort her team put forth Sunday. It was Brackman’s second 20-20 game and tenth double-double this season. At halftime, she already had 13 points,10 rebounds and three blocks for the Braves, who led 28-24. In the fourth quarter, Loyola’s lack of depth was evident as Bradley outscored them 24-14. Loyola’s bench players did not record a point for the game. 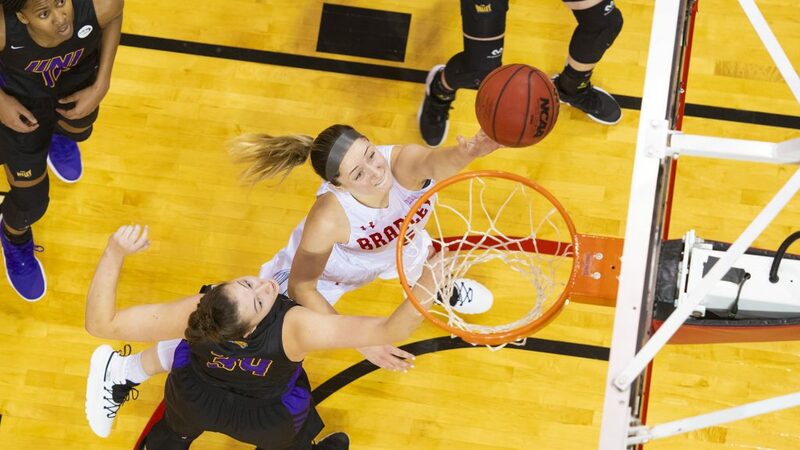 After the game, Gorski stressed the importance of sophomore Emily Marsh, who was placed in the starting lineup on Jan. 20, for the Braves win Sunday. “Emily Marsh really stepped up big for us today. Her having that confidence [she brings] is big for us,” Gorski said. Marsh recorded season highs with nine points and three assists. She was tasked with guarding Loyola’s powerful bigs, who both recorded double-doubles. 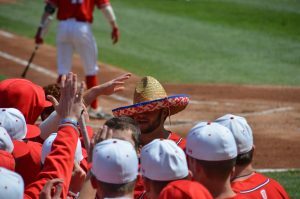 The Braves begin a two game home stand at 7 p.m. tonight against Indiana State followed by a 2 p.m. Evansville matinee Sunday. The Braves have already beaten both teams away from Peoria this season.